In honor of Earth Day, Four Seasons Hotel Westlake Village has planted fruit trees along the perimeter of the Hotel gardens. The choice to plant fruit trees was made to symbolize the Hotel’s commitment, along with the on-site California Health & Longevity Institute, to promote improved nutrition for guests, the community and children in particular. Pomegranates are considered a super food, and are an excellent source of potassium and Vitamins C and B. Another pomegranate tree was donated to Oak Hills Elementary School. Registered dietitians from California Health & Longevity Institute worked with Superintendent Dr. Anthony Knight to improve the nutritional quality of the menus provided to the children in the school cafeterias of several schools within the Oak Park Unified School District. 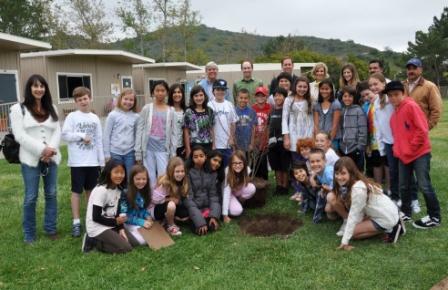 Oak Park Unified School District Superintendent Dr. Anthony Knight, students from Oak Hills Elementary School and representatives from Four Seasons Hotel Westlake Village and California Health & Longevity Institute plant a pomegranate tree donated by the Hotel on school grounds in honor of Earth Day. The tree planting initiative complements the commitment of Four Seasons Hotels and Resorts to plant 10 Million Trees around the world. This long-term global initiative will form the cornerstone of the company’s commitment to supporting sustainability – just part of its existing substantial corporate social responsibility (CSR) efforts. In addition to the new pomegranate tree, Four Seasons chefs use a variety of seasonal fruits and vegetables grown on-site in the Hotel’s gardens and greenhouse. The garden-fresh selections include Swiss chard, cauliflower, tomatoes and a variety of herbs, such as pineapple sage. For more information or reservations, please call (818) 575-3000 or visit www.fourseasons.com/westlakevillage.